John Williams, owner of Trinity Ceramic Supply, Inc. in Dallas, will be presenting a program on the Empty Bowls Project. John is very active in this project that raises funds to feed the hungry. Each year, local artists make bowls of ceramics and wood that are sold at the fund raising luncheon. The luncheon patrons pay $25 for a bowl of soup provided by several of the well-known local restaurants and they get to take home one of the bowls that have been donated by the artists. John will provide us more information about the Empty Bowl Project and will also speak on how to design a bowl, no matter what the material. John grew up in Oak Cliff and became interested in pottery while in elementary school because of a pottery factory in the neighborhood. John studied ceramics while attending SMU and also at Florida State University. John also taught Ceramics at the University of Dallas for 5 years. John and his wife, Darlene, have two daughters, Angela and Catherine. Angela is a successful clay worker in Dallas. Catherine has just moved to Austin after five years as a conservator at the Museum of American History at the Smithsonian, in Washington, DC. John And Darlene started "Clay Suppliers", selling clay and supplies to potters, schools, and colleges. In 1980, he went to work for Trinity Ceramic Supply, and today they own the company. "You show me yours and I'll show you mine"
Clay Foster, of Krum, Texas is known all over the world for his unique art objects. Clay would like you to bring your turnings for him to discuss the various aspects of design and form, then he will present a slide show of his recent work. 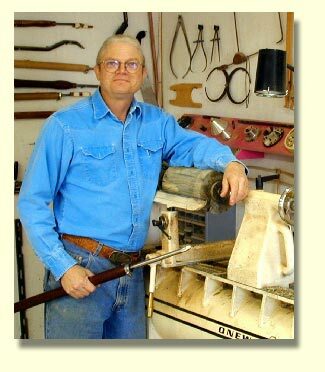 For those of you who might not know Clay, he was one of the founding members of the American Association of Woodturners, a founding member of the Woodturners of North Texas and past president. Although he is a lifetime member of the WNT, he seldom has the opportunity to attend meetings now due to his heavy schedule of appearances and tours around the world to conferences and symposiums where he is a featured demonstrator and guest artist. Larry and his wife have two sons and live in Ardmore, OK. He moved there in 1981 to learn horseshoeing. While there, he got married and stayed. He worked for Michelin, then Uniroyal, as a precision machine alignment and set up mechanic. He spends his spare time woodturning, but does not sell his turnings through any galleries at this time. Although he does sell his work, it is not his main interest in woodturning. He has created a web site to show some of his woodturnings and to share information on woodturning with others who have the same interest. Larry began woodturning in the mid 1980?s to create his own cabinet drawer pulls. Before then, he had never seen anyone turn in person and knew nothing of how to actually start so he began by buying all the books on turning that he could find and when videos became available, he also bought all of those. Trent Bosch, of Fort Collins, Colorado was our Spring demonstrator and "hands on" class instructor from April 28 through May 4. Trent is highly skilled in all forms of turning and best known for his "vessel within a vessel" turnings concept that brought him into the spotlight at the 1997 AAW symposium in San Antonio. He taught a limited number of classes and an all day demonstration. He was the featured demonstrator at the regular monthly meeting on April 28. In addition, there was an all day demonstration on Saturday, April 30 at the R. D. Evans Community Center where the club has its regular monthly meetings.If you have the Fall 2001 issue of American Woodturner (Vol. 16, No. 3), Trent Bosch is featured in an article by Ken Keoughan. 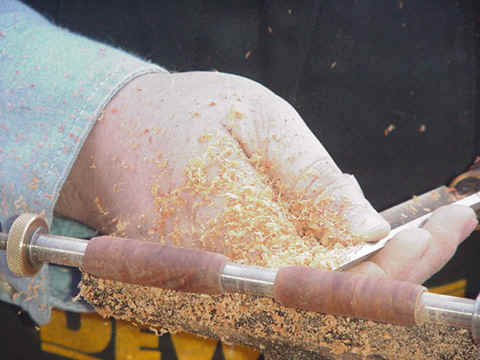 "Using Hook Tools for Hollowing End-Grain Vessels"
Wayne Clowers takes a pragmatic approach to most things that he deals with and woodturning is no exception to his practical, common sense way of solving problems. Wayne retired from the Fort Worth ISD after twenty-five years as a math teacher and six years at the Fort Worth Skills Center as the Curriculum Coordinator where he worked with vocational education curricula that included wood shop, welding, auto mechanics, television, and refrigeration / air conditioning classes. Wayne has been a woodworker for forty years. He started with the club in 1993, but feels that he did not really improve his turning skills until he began attending “Texas Turn or Two” and turning classes in the spring with Stuart Batty, David Ellsworth, and just recently with Trent Bosch. In the demonstration this month, Wayne will present his practical approach in using the "hook tool" to hollow vessels. The hollow vessel for his demonstration will be characterized by a large base and a small opening at the top. Paul Tiefel grew up in central Oklahoma and has been woodworking since his early teens. He learned basic carpentry and cabinet making in his father’s shop and got his first taste of woodturning in jr. high school shop class. During his high school years he worked in commercial and residential construction during school breaks. Paul passed the journeyman carpenter’s exam and paid for most of his college by working as a carpenter. He planned to obtain an architectural engineering degree and follow his father into commercial construction. However, after winning a partial scholarship he entered the petroleum engineering college at the University of Oklahoma. He planned to change to architecture but stayed with petroleum engineering after becoming interested in the exploration of oil and gas. During his career in the oil and gas business, Paul maintained his love of woodworking but had limited time to spend in his shop. Paul left the oil and gas business in 1999 and he and his wife Marcia moved from Houston to North Texas in 2001. Paul rediscovered turning in 2002 while taking a class with John Horn at the Woodcraft store. John introduced the class to the Woodturners of North Texas and Paul joined on his first visit. Paul has also taken classes with Stuart Batty, Ernie Newman, Jean-François Escoulen, David Ellsworth, Michael Hosaluk and Trent Bosch. Paul enjoys a challenge and is constantly trying new turning ideas. He became interested in multi-axis turning after watching a demo by Chris Scott at the 2003 AAW Symposium. Paul took a 5-day class with Escoulen in 2004 where he got to experiment with many multi-axis turning ideas. In his demonstration, Paul will show how to turn a figurine, a candlestick and a spider double box if time allows. 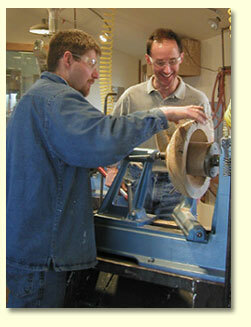 Jeff Carrell has been a woodturner for over six years and a hobby woodworker for most of his life. Although his working career has been in the electronics, computer and Internet fields, his love for working with wood has always been something he wanted to expand and spend more time doing. At the end of 1998, Jeff sought the wisdom and knowledge of his lifelong friend and neighbor Alan Siebenthall concerning pen turning. Alan provided enough information for Jeff to equip his new shop for this new hobby, and off he was. Jeff almost exclusively turns pens, but has a desire to expand his turning capabilities and knowledge - someday - but is not in any hurry to do so just now. 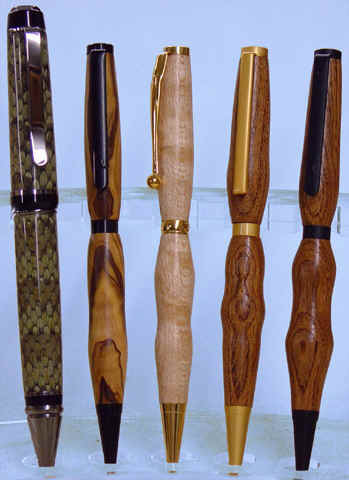 Jeff makes the pens mostly as gifts for friends, business associates, relatives, and just for folks who are nice! Jeff is an independent network consultant in his "day job", with a focus on network security training. He also applies his computing talents supporting websites for other turners, hobbyists, and woodworking nonprofit entities. However, Jeff spends as much time in the shop as possible, which is generally not enough, but he takes what he can. Jeff is an active member of the Woodturners of North Texas and also supports their email system and is the webmaster for the Southwest Association of Turners. Jeff has demonstrated at Texas Turn-or-Two in 2003 and at numerous Freedom Pen Project pen turning extravaganzas, and is scheduled to be a demonstrator at SWAT in 2005. Jeff hosts a pen turning group called "Bubbasville" at his shop. Anyone interested in sharing techniques and tips about pen turning, making some shavings, and enjoying the camaraderie are always welcome. See www.bubbasville.com for more information. For the last three years, Jeff has started to collect functional foot powered machinery circa late 1800's. The idea of using equipment powered only by your own energies and also working with wood at the same time has intrigued Jeff for many years. He currently owns a Barnes #3 Velocipede Lathe, a Barnes #2 Velocipede Scroll Saw, a Barnes Former, and a Barnes Combination Saw (table saw). Jeff's demonstration will be on pen turning: from beginning to end, covering traditional and new materials, and also a few different finish types. For our August demonstration John Horn will present his SWAT demonstration, "The Art of the Peppermill". Although peppermills have been around for a very long time, there have been improvements lately in the mechanisms and new designs that are attracting a lot of media attention along with the attention of connoisseurs interested in "haut niveau de moulin à poivre" (roughly, high-class peppermill). A peppermill is not only a useful table accessory, but it can be a functional work of art as well. While producing one that will actually work is not technically difficult, there are a number of details that must be considered in the proper order when making your first peppermill mechanism to fit into the body of the mill. We will explore the turning, drilling, fitting, and technical aspects of making a peppermill. Design considerations which must be addressed as you explore your own creative desires will be an integral part of the demonstration. 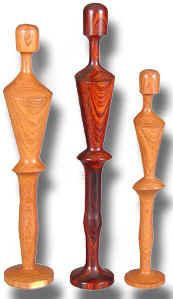 Creating your own shape for the peppermill can be rewarding. Custom designs bring your work to a new plane as it becomes art instead of just a functional kitchen item. Need a gift for a wedding, a birthday, a holiday, or just any occasion? A hand crafted peppermill will be cherished for a very long time and your cost will be a lot less than you would pay for a department store gift. Eighty-seven year old “Pinky” Martin developed his own style, sent one to the very popular Sara Molton on the Food Network. Sara then gave one to Oprah Winfrey on her live television show. Pinky was flooded with orders and now has quit taking orders because he is booked up for three years in advance for his custom designed peppermills that sell for $250 each. For our August demonstration Jimmie Arledge will show how to make at least five different items that can be used as gifts for a variety of occasions. One of the items he will demonstrate will be a top that actually whistles. None of the pieces will use hardware kits, just easily obtainable wood that you might have sitting around the shop. All the projects can be produced on a mini-lathe. 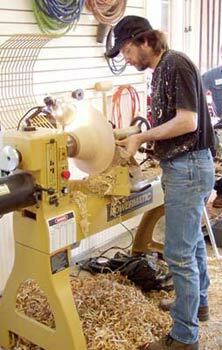 Jimmie Arledge joined the Woodturners of North Texas in 1994 and became Vice President in 1999. 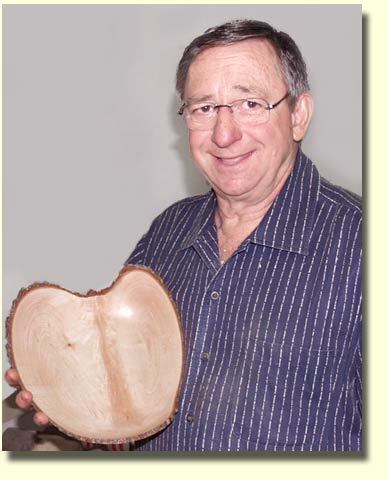 He is also a Past President of the Dallas Area Woodturners. Jimmie has studied and hosted workshops with such famous woodturners as Michael Hosaluk, Jean-François Escoulen of France, Ernie Newman of Australia, and Phil Brennion, President of the AAW. He will be assisting Clay Foster at Arrowmont this year as he makes his annual trip to this most well known school of arts and crafts in Gatlinburg, Tennessee. Each month, Jimmie opens his well equipped shop for hands on participation by club members of our area. "Which is Better: The Gouge or the Skew?" For our October Demonstrator Fred Denke will talk about his process in learning to turn wood. This will include the lessons he used in developing turning skills. The demo will include turning a recipe holder using the Skew and a weed-pot using the side grind half-inch bowl gouge. Fred Denke retired on January 1, 1999 from work as an engineer in the aircraft industry. He grew up on a farm in central Texas near Waco. As a farmers son working with wood was part of farm chores. This work let him use woodworking tools at an early age. In his adult years he continued to do woodworking using hand tools and a nine-inch table saw. This woodworking led to the curiosity of woodturning, so after retirement and buying a medium size lathe he was a woodturner. Fred has led two AAW Collaborative Projects. The Coffee Grinder presented at the 2005 Symposium in Kansas City, KA and the Dirigible presented at the 2000 AAW Symposium in Charlotte, NC. He has attended several "Texas-Turn-or-Two" and SWAT symposiums. He has spent a week at Arrowmont with David Ellsworth as the instructor. He also has attended all day hands on with Lyle Jamison, Stew Batty, Michael Hosaluk and Jacques Vesary. "Finishing the Bottoms of Bowls"
Pleas McKee will be presenting his SWAT demonstration on finishing the bottom of bowls. Getting a smooth bottom finish is ranks as one of the more difficult parts of bowl turning. The techniques that Pleas will demonstrate are valuable in turning better bowl bottoms. Pleas began turning in 1989 after he saw a picture of one of Todd Hoyer's wing vessels. 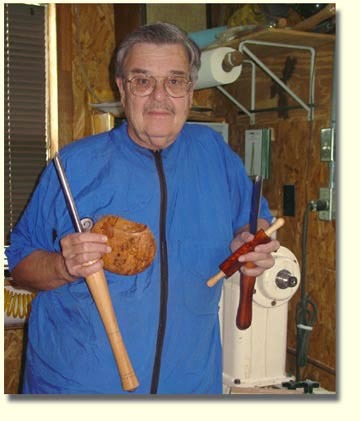 He did not know anybody else who did woodturning at the time so he taught himself. Pleas used the tools off and on for about six years before learning their names. And then, by chance, he heard about Texas Turn-or-Two and went to see what other people were turning. After that, life has not been quite the same for Pleas McKee. Pleas taught wood shop at a middle school (7th and 8th grade) for ten years and learned to teach woodturning to beginners. All of his demonstrations are geared for beginning students and reflect safety, proper tool use, majoring on the minors, if you will. 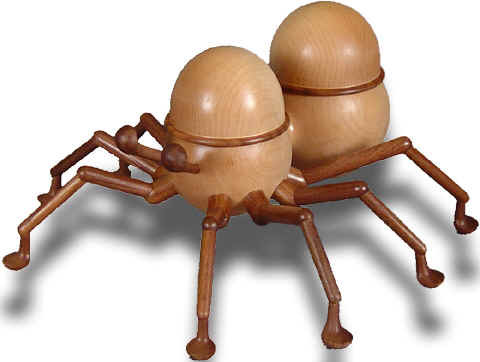 He has been fascinated with finishing the bottoms of turnings and has used four techniques to produce them. Pleas McKee will demonstrate the three methods that he is the most comfortable with using: the jam chuck, donut, and Cole (or Jumbo) jaws. He will also discuss making, pros/cons, and demonstrate them in turning. While these are not the only methods, we are all still learning about woodturning, and as this is an interactive demonstration, club members are encouraged to ask questions, share experiences, and explore new ideas with the demonstrator!